Banana salad recipes are some of the favorite dessert salad recipes being that bananas are one of the favorite fruits. Dessert salads usually have a combination of two or more of the following ingredients; gelatins, whipped toppings, different fruits, mayonnaise, sour cream, miniature marshmallows, chocolate and could even have some vegetables. These make a light dessert and are transportable, making a good dish for a pot luck dinner or church supper. 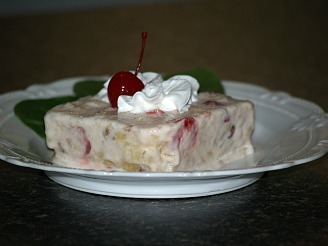 Frozen fruit salads make great light desserts in the summertime; try the following two recipes. Mix all ingredients well; pour into a 9 X 9 inch pan and freeze. Cut into squares and serve on lettuce leaves. Combine in a small pan lemon juice and enough reserved juice to equal 1 cup. Sprinkle gelatin over juice and let set 5 minutes to soften. Dissolve gelatin over low heat stirring constantly; remove from heat. Beat cream cheese and mayonnaise until smooth. 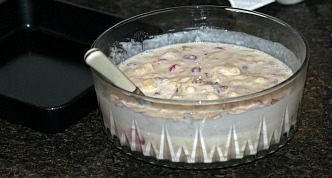 Add marshmallows, bananas, pineapple, oranges and gelatin into creamed mixture and blend well; fold in cherries. Spoon into wax paper lined loaf pan and freeze for at least four hours. To serve turn out onto platter and cut in slices; serve on a bed of watercress. This is one of the banana salad recipes which uses my favorite combination of fruits; banana, strawberry and pineapple. You cannot go wrong with this mixture no matter what other ingredients you add. Stir gelatin into boiling water until dissolved; cool. Add frozen strawberries, bananas, pineapple and cashews. Pour half of gelatin mixture in a 9 X 13 inch pan; refrigerate until set. 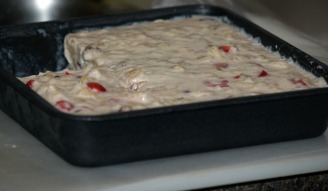 Spread top with sour cream. Cover with remaining gelatin mixture; refrigerate until set. Cover with whipped topping; refrigerate until set. This fruit salsa recipe is delicious served on ice cream or fresh pound cake. We usually think of salads as being served cold but this one of the banana salad recipes which is served warm. Although a little different it is still very delicious, especially served with ice cream. Combine Port wine, sugar, tapioca, cinnamon, cloves, ginger and nutmeg in a small pan; let stand 5 minutes to soften tapioca. Heat mixture over medium low stirring until it thickens. Add apples and raisins stirring and cooking 5 more minutes. Stir in bananas and strawberries; serve warm. Combine cracker crumbs (Reserve ½ cup) and melted butter in a bowl. Mix crumb mixture well and press into 9X13 inch baking dish. Combine pudding mix and milk in a mixing bowl; beat until well blended. Add softened ice cream to pudding mixture and blend well; pour over the crumb mixture in dish. Prepare whipped topping mix according to package direction; spread over ice cream layer. Sprinkle reserved ½ cup crumbs over whipped topping layer; chill in refrigerator until set. Dissolve gelatin in water; set aside. Bring peach juice to a boil in top of double boiler. Add the gelatin mixture, marshmallows and sugar to the peach juice. Cook mixture until lightly congealed; add peaches, bananas and lemon juice. Beat egg whites and salt until stiff peaks form. Fold beaten egg whites and whipped cream into gelatin mixture.